I have an uncle who makes wine. He lives in Philadelphia, and gets grapes trucked in from California from the wholesale market in South Philly. He takes them home, grinds them up, and makes some really nice wines. When we are traveling through, we often sit on the back deck, and enjoy a bottle or two. I decided I wanted to try my hand at winemaking, but living in Maine, I can not get the fresh grapes. That would require traveling too and from Boston, adding significantly to the expense. I could do wine from a kit, but that just does not have much appeal for me. So, instead, I decided to work a fruit readily available in New England with a long history of making a delicious beverage, apples. The fruit grows like gangbusters in New England, and was used initially by the settlers to make their beverage of choice, cider. Johnny Appleseed, originally from Massachusetts, was famous for spreading apples over Ohio and Indiana, but the purpose of apples at that time was to make hard cider (only in the US does cider have to be denoted as hard or soft, everywhere else, cider is alcoholic). Cider was consumed as a beverage, but just as importantly, was turned to vinegar. Cider vinegar was critical in preserving food via pickling, and according to William Coxe, a pomologist from Philadelphia who worked after the Revolutionary War, the vinegar would sell for triple the price of the cider itself. As apples are readily available here, and given my enjoyment of the historical context of cider in New England, I had to give this a try. Most of the hard cider I had from other homebrewers was cider bought already pressed from the local orchards and then fermented. While that makes some decent stuff, you are at the whim of the cider maker as to what apples are used and how they blend them. I wanted more control over the process. Apples taste so different, and I wanted to try making cider with different varieties. Furthermore, apples that give good final results as hard cider are often not the best to eat out of hand. Most cider in the US is pressed from the apples the orchards grow to sell as dessert or eating apples, but can’t sell because of imperfections in the fruit. The English and French both use apples that can be so tart or so bitter that they can’t be enjoyed fresh, but are used to make the backbone of a fine cider. As the US does not tend to make much hard cider now, those varieties that were used to make hard cider in the 1700’s and 1800’s are not grown here anymore, most trees being torn out and replaced with varieties that are better for selling fruit in the supermarket. In my research, however, I learned it is possible to use crab apples as a substitute for those bitter and tart cider apples of Europe. To do so, I would have to press my own. Planning this out originally, I did quite a bit of reading. I came across a few useful books. Ben Watson’s “Cider Hard and Sweet” is a very interesting read, and walks you through the basics. However, I found that Annie Proulx and Lew Nicohols “Cider” had much more information about the varieties of apples and how to blend them. I also had a chance to try a few commercial ciders. I noticed English ciders tended to be quite dry, and pretty strong, about 7%. They are usually fermented completely. Fresh pressed cider will ferment below a SG of 1.000, just like wine, leaving you with a very dry, crisp final product. English Cider is usually fermented like this, then may be backsweetened, or they may be left dry. However, the French Ciders I tried where all sweeter, and had a much lower alcohol content, about 3-4%. The French,through a traditional process of stripping the nitrogen out of the cider, starve the yeast of nutrients and prevent full fermentation, leaving residual sugar and thus produce much sweeter ciders. This added extra layers of complexity, so I decided to skip this, and stick with a more straight forward, full fermentation approach the English favor. There are also American orchards that are making their own ciders. One of the most famous is Farnum Hill of New Hampshire. If you get a chance check out their ciders, but small cider makers are popping up all over the North, so just look around. Kennebec Cider from my neck of the woods is an example of this. Being a seasonal product, I decided to make my cider every fall, let it age, and then bottle or keg the cider and enjoy it the following year. 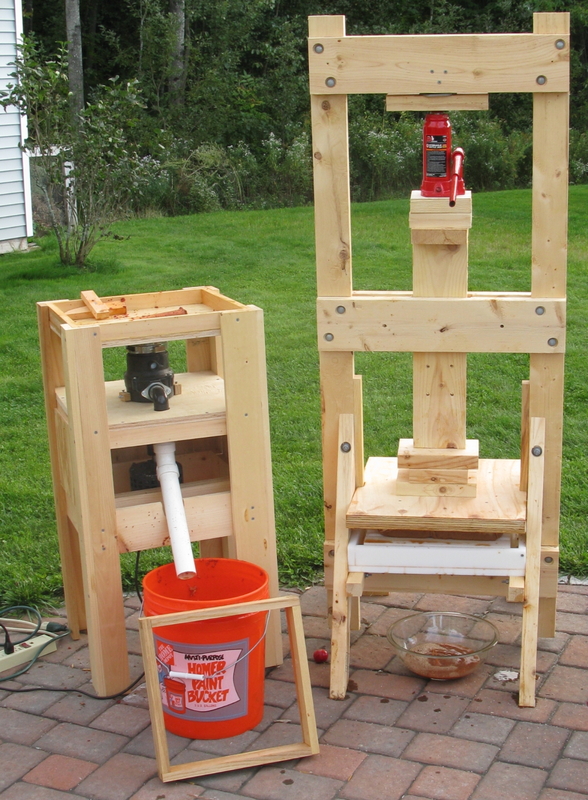 In subsequent posts, I will outline the equipment I use (yes, that is an apple grinder made from a garbage disposal, and a press powered by a car jack), the apples I use, and the final products I have made. I encourage anyone who has thought they may like to make cider to give it a try. It is pretty easy, and depending on your source of apples/juice, you can get a product that really reflects your immediate surroundings and is unique to that time and place. Enjoy!